Organic, first cold press extra virgin olive oil. UNASCO certified* supply chain traceability. *The Michele Fierro Agriculture Farm adheres to the traceable supply chain of the UNASCO network of olive growers, UNI EN ISO 22005.08, certified, monitored in all the phases of production process, from the field to the packaging. 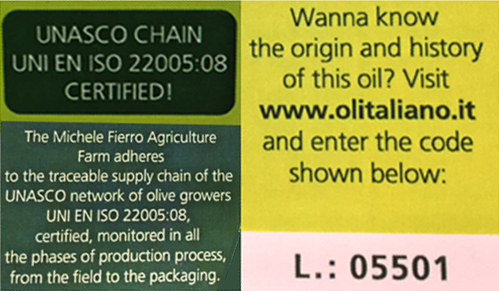 Visit www.olitaliano.it and enter code 05501 to read more.